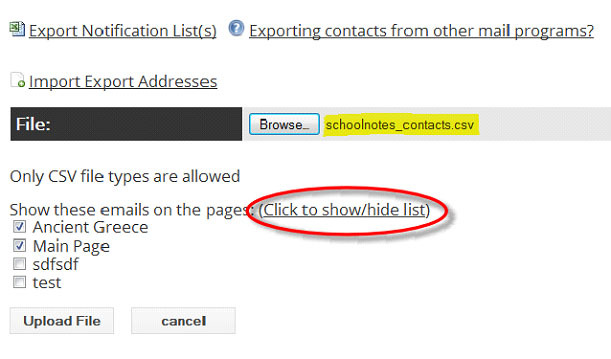 Uploading a CSV file is a quick way to add email contacts to your ‘Contacts’ and ‘Newsletter’ notification lists. *Please see ‘Creating a CSV File’ for instructions on how to create an up-loadable contact list. 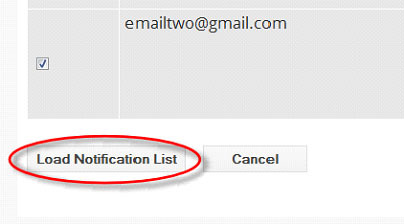 1) Click on "Contacts" in the left margin of your desk and select "Import/Export Notification List." 2) Browse your file folders until you locate your CSV file. (If your pages are not visible, select ‘Click to show/hide list’ to reveal) Check the box next to the name of the page(s) that you want the list assigned to and then click ‘Upload File’. *Important* Be sure that there is no space in the title of the CSV file. 3) Next you will need to match the corresponding fields within your CSV file with the matching field type in the system, then click ‘Continue’. Then select "Load Notification List." Select "Newsletters" located in the left margin of your dashboard and then select "View Subscribers." A new window will open. Select "Import/Export Subscriber List" *Important* Be sure that there is no space in the title of the CSV file. Locate the file name and upload the file.